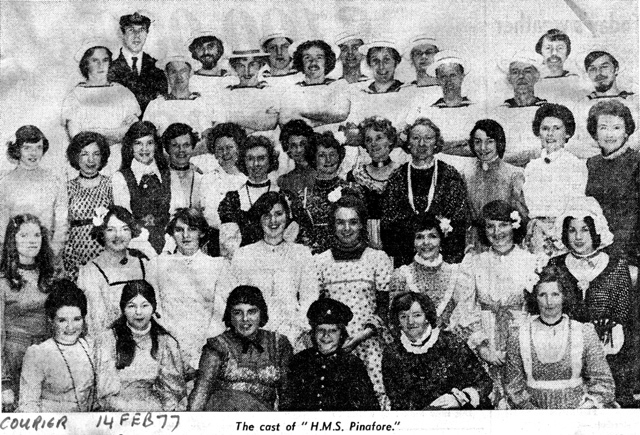 HMS Pinafore was the Society’s main show in 1977, with a cast that was 100% different from 2008, although some of the cast listed in the programme are still to be seen in our audience and our list of Society Friends. The first way in which the evening was different was that the main show was preceded by a “curtain-raiser”. There was certainly a precedent for this: in the 1950s and 1960s, the D’Oyly Carte company used to precede performances of Pirates and Pinafore, the two earliest and shortest operas, with either Cox and Box or Trial by Jury. What was new this time was the combination of one of Gilbert’s short humorous poems with a selection of Sullivan’s music. For fuller details, read the programme for the show. The text of the Bab Ballad that was adapted is at this link. The second way in which the show was different was that it was was performed at two venues, at the Carnegie Hall and in the recently-opened Lochgelly Centre which had become the home port for the Society. More about that at this link. The Society had many links with the Naval Base at Rosyth, which were shamelessly exploited for publicity! And the archives also contain a pretty favourable press review. The advertising flier is interesting, in that it shows how comparatively cheap our pleasures seemed to be in the 1970s. That is until you realise how low average wages were!